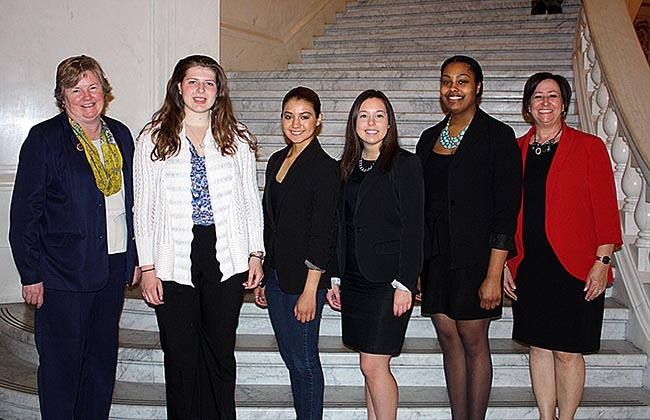 As part of Montgomery County Community College’s new Legislator Shadowing Program, four female students recently spent a day with female members of the Pennsylvania House of Representatives in Harrisburg to get a firsthand experience of leadership careers in public service. The College’s Legislator Shadowing Program started as the result of a 2014 legislative panel discussion held at MCCC featuring Pennsylvania Representatives Marcy Toepel, Madeleine Dean and Kate Harper with College President Dr. Karen Stout as the facilitator. During the discussion, the legislators noted there are few females in the Pennsylvania legislature. According to data reported on the National Conference of State Legislatures’ website, only 1,732 women, or approximately 24.2 percent, serve in the 50 state legislatures in 2015. In Pennsylvania, there are 45 women, or about 17.8 percent, who serve in the legislature. For the recent visit, students Caitlyn Verdin Sorian, 19, Norristown; Kayla Burnham, 20, North Wales; Rachel Glazman, 17, Schwenksville; and Rachel Lightstone, 17, Eagleville, started their day by meeting with host Representative Toepel, who shared information about her responsibilities, as well as her background. Glazman and Lightstone are both dual enrollment students, who are taking classes at both MCCC and their high schools, Perkiomen Valley and Hatboro-Horsham, respectively. The students then observed a Judiciary Committee Meeting held in the Majority Caucus Room. The committee members discussed and approved several proposed bills and amendments on various topics, including domestic abuse, custody and the Uniform Transfers to Minors Act. The students researched the proposed bills prior to their visit. “It was great experience to see legislators actively discussing different aspects of the bills during the Judiciary Committee Meeting,” said Verdin Sorian, who is majoring in Political Science. Following a visit to the House Floor and observing a press conference held on the rotunda steps, the students participated in a roundtable discussion with female legislators and staff to learn more about their careers. Guests included Representative Toepel, Representative Kate Harper, Representative Madeleine Dean, Research Staff member Jen Weeter, Communications Staff member Alison Evans, Legislative Data Processing Executive Director Kathy Sullivan, lobbyist Ashley DeMauro and Deputy Director Tricia Harris. Additionally, Representatives Pamela DeLissio and Representative Mary Jo Daley spoke with the students while they were visiting the House Floor. The remainder of the day’s agenda included a behind-the-scenes tour and a visit to the Senate session. The College’s Legislator Shadowing Program also enhances its existing Legislator in Residence Program, which was started in 2012 by Lee-Clark and Empol-Schwartz. For the residence program, members of the Montgomery County State Legislative Delegation and their staffs are invited into Empol-Schwartz’s American National Government and American State and Local Government classes during each semester to provide a firsthand perspective of the concepts students read in their textbooks. Prior to the guest lectures, students are required to research the background and positions of each legislator and develop questions for discussion. The program was expanded last fall to include legislator visits to Assistant Professor of Economics Jill Beccaris-Pescatore’s Introduction to Economics class. Montgomery County Community College President Dr. Karen A. Stout was presented with Phi Theta Kappa’s 2015 Shirley B. Gordon Award on April 16 during the organization’s 97th annual convention in San Antonio, Texas. The award is given annually to college presidents and campus CEOs for their outstanding efforts to promote the goals of Phi Theta Kappa (PTK), an international honor society for students of two-year colleges. Dr. Stout is one of 23 college leaders to receive the 2015 award. 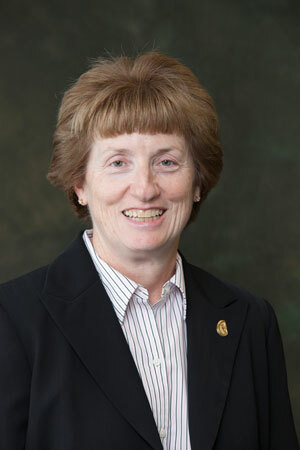 At Montgomery, student participation in Phi Theta Kappa has grown significantly during Dr. Stout’s tenure as president. Under her leadership, a second PTK chapter—Beta Tau Lambda—was added in 2005 at the College’s West Campus in Pottstown, complimenting the longstanding Alpha Kappa Zeta chapter at the Central Campus in Blue Bell. Both chapters consistently achieve the distinction of Five Star Status—the highest level of national recognition possible—for progressing through PTK’s Five Star Chapter Development Plan. Recently, in recognition of the impact PTK membership has on student success and completion, Dr. Stout generously pledged $30,000 to establish a Phi Theta Kappa Annual Challenge Fund through MCCC’s Foundation. “Phi Theta Kappa members in Pennsylvania have an overall success rate of 92 percent; yet, only 14 percent of PTK-eligible students join the organization. The cost of membership is a clear barrier,” said Stout. The Karen A. Stout Phi Theta Kappa Challenge Fund at Montgomery County Community College supports qualified students by defraying half the cost of a PTK membership, which is currently $60, while challenging students to match the remaining cost. Dr. Stout will begin her tenure as president and CEO of Achieving the Dream, Inc. on July 1, 2015. There, she will bring her passion for student access and success to more than 200 community colleges and nearly four million students in 35 states. The Shirley B. Gordon Award is named for the late Dr. Shirley B. Gordon, Phi Theta Kappa’s longest-serving Board of Directors chair and president emeritus of Highline Community College in Des Moines, Wash. Gordon was named Phi Theta Kappa’s Most Distinguished College President in 1984. To learn more, visit ptk.org. 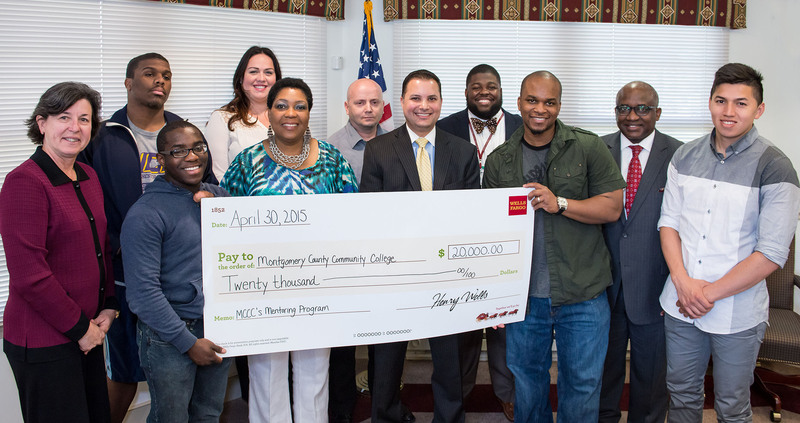 Wells Fargo recently presented a $20,000 grant to Montgomery County Community College to provide financial assistance for students participating in the College’s Minority Student Mentoring Initiative (MSMI) to enable them to complete their programs of study and graduate. Wells Fargo’s generous grant will provide scholarships to 10 students who participate in the MSMI program, have a proven financial need and are committed to graduate. In 2014, the College received the national Leah Meyer Austin Award by Achieving the Dream for its outstanding work in supporting student success, including improving the persistence rates for minority students through MSMI. In 2009, Montgomery first launched its Minority Male Mentoring Program to close the nationally documented achievement gap for African-American male students. The program connects participating students with caring mentors for guidance and support while providing opportunities for civic engagement, academic advisement, personal development and leadership development. Between 2009 and 2013, participants showed a term-to-term persistence rate of close to 80 percent—significantly higher than the 63 percent for non-participants. In 2013, the initiative was expanded to include African-American and Latina female students and was renamed the Minority Student Mentoring Initiative (MSMI). Currently, MSMI provides one-one-one mentoring and access to wrap-around support services to more than 150 minority students enrolled at the College. One participant, Jacori McEachnie, 18, Eagleville, says the program has opened new doors for him. For the summer program, selected students enroll in two courses at Bucknell University in Lewisburg, Pa. Participating students then have the opportunity to apply to Bucknell in 2016, and if accepted, they will transfer to the university with junior status on full-tuition scholarships. Additionally, MSMI assists students who are enrolled in the College’s Gateway to College program, which serves high school students who have dropped out of school or who are not track to graduate. Gateway students enroll in courses designed to help them achieve their high school diplomas while receiving college credits. Currently, 17 school districts and the Montgomery County Workforce Investment Board partner with the College and refer students for the program. Montgomery is one of only 42 colleges in the country and only the second college in Pennsylvania selected to participate in the Gateway to College National Network. Montgomery County Community College’s chapter of Phi Beta Lambda (PBL) earned several awards during competitions at the PBL State Leadership Conference April 11-12 in Harrisburg. Three MCCC students earned second place awards in the Business Decision Making competition. They are Abel Cruz, of Philadelphia, Wes (Carlo) Pipitone, Horsham, and Candice Yohe, Willow Grove. During the PBL State Leadership Conference, Montgomery’s students competed against chapters from across the state, including four-year institutions such as Drexel University, Penn State University and University of Pittsburgh. Along with the competitions, MCCC students participated in workshops and business events during the conference. Phi Beta Lambda is a student-led, collegiate-level organization of the Future Business Leaders of America (FBLA). For more information, visit fbla-pbl.org. Check out “The Buzz Update” for the week of May 4, 2015. The program is student produced by the Communicating Arts Production Group (CAPG) at Montgomery County Community College. Time to pull out your clubs and get ready to hit the links at Talamore Country Club, Ambler, for Montgomery County Community College (MCCC) Foundation’s 11th Annual Leading Women Symposium and Golf Experience on Monday, June 1. This fun networking event supports scholarship, career and leadership development programs for MCCC female students. All women are invited to attend—to register, visit mc3.edu/lw. Check-in on the day of the event starts at 9:30 a.m. followed by a brunch symposium at 10 a.m. Golf begins at noon and will be played in an 18-hole, team scramble/best-ball format and is designed for those who have some golf experience. A networking reception and awards ceremony will follow at 4:30 p.m.
For participants who would like to learn the game of golf or improve their skills, a learner’s program is available as part of the event. Pros will assist with skill development through various learning stations, and golf clubs will be provided. 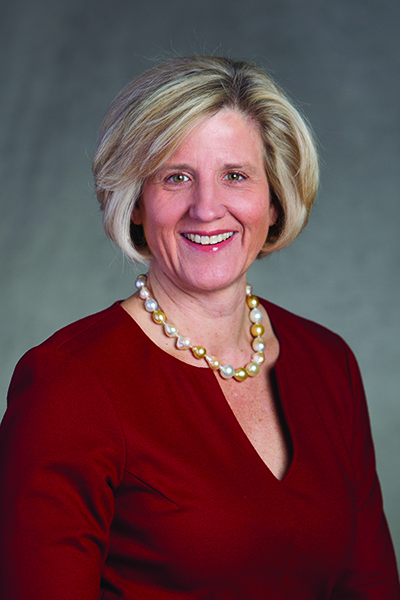 Pennsylvania’s Acting Secretary of Transportation Leslie S. Richards is the keynote speaker for Montgomery County Community College’s 2015 Foundation’s 11th Annual Leading Women Symposium and Golf Experience. This year’s keynote speaker is Pennsylvania’s recently appointed Acting Secretary of Transportation Leslie S. Richards, who has extensive leadership experience in both the public and private sectors spanning more than two decades. 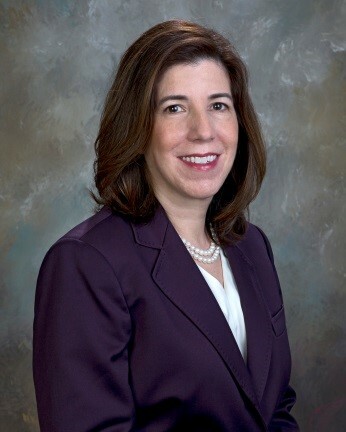 Prior to her current role, Richards served in the positions of vice chair of the Montgomery County Board of Commissioners and chair of the Delaware Valley Regional Planning Commission. Additionally, she served on the boards of the Southeastern Pennsylvania Transportation Authority, the Greater Valley Forge Transportation Management Association and the Whitemarsh Township Board of Supervisors. In the private sector, she held the position of senior project manager at a woman-owned civil engineering firm and as a public involvement specialist at a consulting firm. In these positions, her experience ranged from managing multi-million dollar infrastructure projects to writing long-range strategic plans. For her consulting work, she was recognized for minimizing the negative impacts of construction, detours, and road closures in the local business community. Richards is a graduate of Brown University, where she studied economics and urban studies. She received a master’s degree in regional planning from the University of Pennsylvania. She is a lifelong resident of Pennsylvania and resides with her husband and three children in Montgomery County. The 2015 Leading Women’s Award will be presented to Dolores Lare, Chief Operating Officer of Continental Bank. In addition to the keynote presentation, the Foundation will present the 2015 Leading Women’s Award to Dolores Lare, who serves as chair of MCCC’s Foundation Board and as co-chair of MCCC’s Leading Women in Philanthropy. With a lengthy career in the banking industry, Lare currently holds the position of Chief Operating Officer of Continental Bank. Prior to this position, she was Executive Vice President of Operational and Technology Services for Progress Bank. While at Progress, she was a member of the Executive Management Committee and the Chairperson of the Technology Steering Committee. Prior to joining Progress, she was Chief Operating Officer at Prime Bank, where she was responsible for leadership of all operational and technological activities. Before that, she was employed by PNC Bank for more than 20 years with her last assignment being director of the bank’s Eastern Region Operations, where she managed a staff of 950 employees with an annual budget of $50 million. Before joining PNC Bank, she was a member of the senior management team at MidAtlantic Bank and Continental Bank. Lare holds a bachelor’s degree in Business Administration from Saint Joseph’s University and a master’s degree in Organizational Management from the University of Phoenix. In 2014, more than 130 business women attended this popular annual symposium, and the event raised more than $45,000 to support women’s programs and scholarships. For more information about the Leading Women Symposium and Golf Experience, email foundation@mc3.edu or call 215-461-1139. Dynamic business leader Lynn Utter will deliver Montgomery County Community College’s 2015 Commencement address on May 21 at 7 p.m. in Blue Bell. Utter most recently served as president and chief operating officer of Knoll, Inc.—headquartered locally in Montgomery County, but recognized worldwide as a leading designer and manufacturer of branded furniture and textiles. Much like the company’s iconic designs transformed the way people furnish their homes and offices, Utter, and visionary leaders like her, are transforming the role workforce development plays in building vibrant communities. “Education and industry are critical pieces of a community’s comprehensive workforce development strategy. Such a strategy builds multiple pathways with multiple access points: high school to college; college to transfer or employment; employment to retraining, and all of the many steps in between,” said Dr. Karen A. Stout, president. “As illustrated by her outreach efforts at Knoll, Ms. Utter values an educated and engaged workforce that is part of the larger community. Through Utter’s outreach, MCCC and Knoll partnered on several diverse initiatives. Both organizations were early partners with the PerkUp Workforce Consortium, a unique collaboration of business and industry leaders, government officials and educators working together to develop a 21st century workforce for the Upper Perkiomen Valley. In 2011, Utter gave the keynote address at the Foundation’s Leading Women Symposium and Golf Experience, which supports women’s scholarships and programming through the College’s Foundation. And, in 2012, the College hosted an art exhibition featuring the architecture and design work of Florence Knoll Bassett. 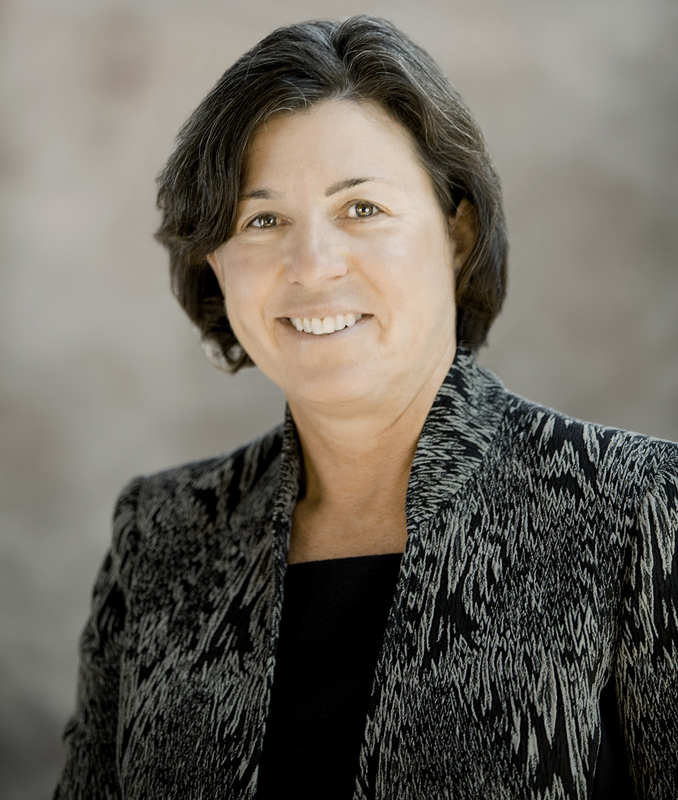 Before coming to Knoll Inc. in 2008, Utter worked in a variety of operating and strategic positions at Coors and Frito-Lay, as well as with Strategic Planning Associates in Washington D.C. She is a Henry Crown Fellow at the Aspen Institute and has held leadership roles with a number of organizations that support the advancement of women in the workplace. Currently, Utter serves as a director for WESCO International and on the Internal Audit Committee for The University of Texas. She has also served on several non-profit boards, including Stanford Graduate School of Business, The University of Texas and the United Way. Among her many accolades, Utter has received the 2015 Paradigm Award from the Greater Philadelphia Chamber of Commerce. She has been inducted into the McCombs School of Business Hall of Fame and recognized as an Outstanding Young Texas Executive. In addition, she received the John Gardner Award for Service, as well as the Award of Merit from Stanford. Utter earned a Bachelor of Business Administration from The University of Texas at Austin, and a Master of Business Administration from the Stanford Graduate School of Business. Ms. Utter and her husband Ward reside in Devon, Pa., with their two children.